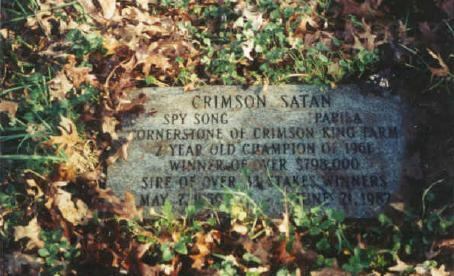 CRIMSON KING FARM was owned by Peter W. Salmen Sr., who imported the Argentine mare *PAPILA and bred her to SPY SONG. Their foal, CRIMSON SATAN, was born here in 1959 and became the Champion 2-Year-Old of 1961. Retired to his birthplace, CRIMSON SATAN became an important sire of precocious speed, carrying on the American male line of DOMINO. CRIMSON SATAN's dam, *PAPILA (1943) is also buried here. Besides the champion, she also produced the stakes winner Cardinal Sin (1954 by Papa Redbird). The farm is now falling into disrepair. -- A.P.